April 14, 2011: Origins Nominations! The Origins Awards nominations were announced Tuesday, and we picked up a few! 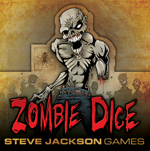 Zombie Dice has a nomination in the Best Family, Party or Children's Game. We'd call it a party game . . . I suppose it could be a family game if your family likes eating brains. It's not a children's game. It's really not. Though it's very cool that Sam and Amelia like it! And we got a Best Gaming Accessory nomination for Alex Fernandez' creation, the Cthulhu Dice Bag. They don't distinguish between the traditional green bag, available everywhere, and the Warehouse 23 exclusive purple one. But with award nominations comes greater awareness, and with awareness comes sales . . . so if you want a purple one, I'd recommend grabbing one now. You wouldn't want them to sell out like the Cthulhu Shot Glasses will! And the Best Game-Related Publication category includes Green Ronin's Family Games: The 100 Best. Both SJ and Phil contributed to this volume, as they did for Hobby Games: The 100 Best, the 2008 winner in this category. Congratulations to editor James Lowder and our friends at Green Ronin! Looking over the list of other nominees, we're in great company. Every game in the Best Roleplaying Game list is either in my library or on my "to-buy" list. Our "competition" in the Best Family, Party or Children's Game category are all great games, and Hamlet's Hit Points is the master's level class for those of us who use Robin's Laws in every gaming session. No matter who wins, it really is an honor to be nominated. So who votes on the nominations? The attendees at the Origins Game Fair in Columbus OH will be given ballots, and the tallying will be done in time for the ceremony on June 25th. If you're in Columbus that weekend, Origins is a great show . . . and if you happen to vote for Cthulhu or the zombies, that wouldn't be bad either!